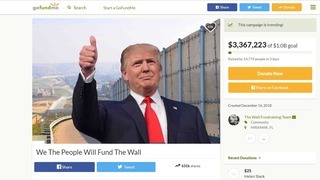 AUSTIN (KXAN) — GoFundMe is set to refund over $20 million in donations Friday after the creator of the viral "We The People Will Build The Wall" campaign changed his plans with what to do with the funds, according to a report by Buzzfeed. The GoFundMe page raised more than $11.1 million through donations in 4 days by over 183,000 people. It now currently sits at more than $20 million in donations. In a Jan. 11 update on the GoFundMe's page Kolage wrote, "to show the government how 'We the People' can get this done, we have formed a Section 501(c)(4) non-profit Florida Corporation named 'We Build the Wall, Inc.' to receive the GoFundMe contributions." GoFundMe spokesperson Bobby Whithorne wrote in an email to Buzzfeed that since Kolfage has changed his campaign's original promise, all donors will receive a refund. A spokesperson for Kolfage's campaign, Jennifer L. Lawrence, took to Twitter to dispute Buzzfeed's report that donors were being refunded. Withorne also told Buzzfeed donors will automatically be refunded unless they choose otherwise. "If a donor does not want a refund and they want their donation to go to the new organization, they must proactively elect to redirect their donation to that organization. If they do not take that step, they will automatically receive a full refund."